Siding — Brown Dog Contracting Ltd. 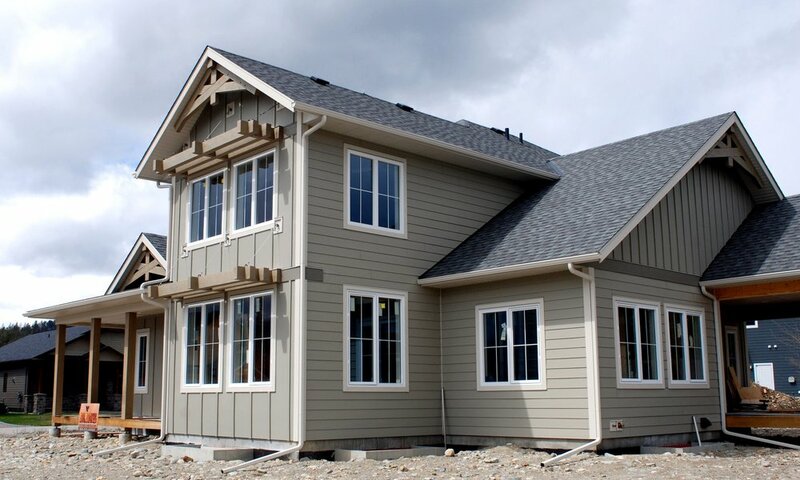 Looking for an experienced siding contractor / installer in Cranbrook and Kimberley BC? For years, vinyl siding has been the most popular option for Canadian homes. For a relatively low cost, it offers an appealing finish with low maintenance. Vinyl comes in a variety of colors and you can also choose between different styles, such as horizontal, board and batten and shakes. There are plenty of different brands on the market and you can expect less expensive vinyl to last about 10 years whereas the most durable options 25-plus with proper installation. Brown Dog Contracting stands behind its work, but we know that weed eaters, barbecues and hockey pucks can do potential damage so that why we offer vinyl siding installation as well as repairs. Fiber cement siding is fast becoming the most popular siding option for new homes and renovations in our area. Why? Because it provides a clean looking finish that is extremely fire resistant, durable and long-lasting. Also fiber cement siding does not become brittle in cold weather, and it won’t crack when the weather warms and freezes. Different styles of fiber cement siding are available. Clapboard (HardiPlank) is the most common but you can also get the board and batten or vertical style, as well as shingles or shakes. Fiber cement siding is engineered to look like wood, but it’s a composite material made from a mixture of sand, cement and cellulose fiber. It is available in a variety of colors and it comes primed and painted from the factory, or it can be painted on site. If you want to change the color down the road, it can be repainted. How long will fiber cement siding last? James Hardie siding, which is the most common, comes with a 30-year warranty. Some fiber cement siding brands boast a 50-year warranty. The warranty on James Hardie’s color technology is 15 years. Fiber cement siding costs more than vinyl and it’s more labor intensive to install. Therefore, it comes with a higher price tag. Keep in mind, however, that fiber cement will likely increase the resale value of your home. You can cut down on costs by installing the product yourself, but you will need specialized tools to cut and nail it. Problems (due to moisture) with fiber cement siding occur when not installed properly. Therefore, it’s best to hire a pro. Is Engineered Wood Siding right for your home? If love the authentic feel and warmth of wood siding, but you don’t want all the maintenance that comes with it, consider engineered wood siding, such as LP SmartSide. Engineered wood siding uses wood strands and bonding agents that are coated with a resin to help it resist fungal decay and insect infestation. It feels like wood and cuts like wood, which means there is no need for specialized tools. There’s also less chance of cracking during installation, when compared to fiber cement siding. Siding contractors also appreciate the fact that with engineered wood siding, there is no harmful dust emitted while making cuts. Engineered wood siding comes in a variety of colors and it can be factory finished or pre-primed to paint on site any color you want. Engineered wood siding comes in lap or board and batten style with a smooth or textured finishes. Want to learn more about siding INSTALLATION options for your Cranbrook or Kimberley home?